& Traditional and Cultural Aspects of Life in the Marshall Islands Nowadays. 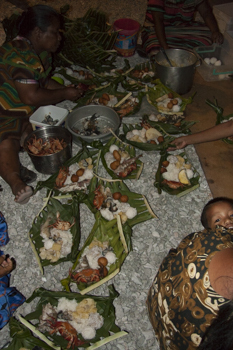 Food is the most important aspect of Marshallese life on the outer islands. People will almost always offer food to anyone who comes to their home, for it is a way of showing respect and offering hospitality. For this reason, it is considered bad manners to refuse the food and one should at least eat a small amount. 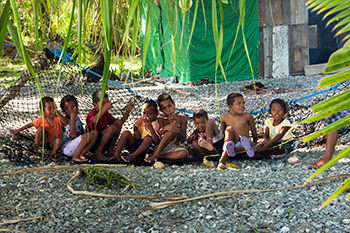 Within an atoll people are usually related, and since Marshallese have very extended families it is also common to share food and feed each other. Each Marshallese is a member of a particular jowi (clan) which is passed through the mother, and traditionally a person was supposed to offer food and shelter to anyone of the same jowi. Although the offering of food, and other goods, varies from person to person and atoll to atoll, it is still extensively followed. The main areas of exception are Ebeye and Majuro where it would be an impossibility to feed everyone. On the outer islands, where resources and means of a livelihood are much more equally distributed, this sharing of food only enhances the harmony (whether real or not) and peacefulness of the island. On most of the outer islands today, the people still eat all types of traditional Marshallese food, although rice, flour, and sugar are highly valued, and bought from the field trip boats when money is available. Breadfruit is still an important food and can be preserved to be eaten as bwiro during the windy part of the year when breadfruit is out of season. There are numerous ways of cooking breadfruit which provides variety in the diet. The coconut tree provides drinking coconuts; coconut meat; coconut milk used in cooking; coconut sap used for drinking, as a sugar substitute for cooking, and as a leavening product in breads and bwiro; and iu (developed coconut embryo, found when the coconut has sprouted) which is eaten often on some atolls when other foods and money are scarce. Traditionally iu was an important food product, but today with copra (dried coconut meat) being made extensively on most islands, often the coconut is destroyed before it has matured and sprouted which is the stage when the iu appears. Other types of foods, eaten in varying amounts depending on their availability on a particular island or atoll, are things such as pandanus, taro, bananas, and arrowroot starch. Naturally, fish of all types, plus certain reef and coral animals such as clams and octopus are eaten extensively on all atolls. On all Marshallese islands the land is divided into land plots called wātos, that usually extend from the lagoon to the ocean. In this way one plot of land will usually include all the various types of plants, trees, and land types. Of course, some parts of the islands are extremely narrow and it is a matter of only a few hundred feet from ocean to lagoon, but with the extended family, and land rights of each individual from both parents and extended family, usually an individual’s rights to use various land plots will provide for a fairly equal distribution of various types of resources. But since everything is done through and for the family, the individual’s rights are usually of little concern, except as they apply to the family and household unit. Most Marshallese households consist of a sleeping house, cook house, and working or storage area. On Ebeye and Majuro this has become greatly modified because of crowded conditions, and the use of electricity and kerosene stoves. But on the outer islands most wātos, where an extended family unit lives, have all three types of structures. Often times there may be more than one sleeping house, but usually only one central cook house where everyone cooks and shares the food. Usually a household consists of ten to twenty people, with almost always a few old people and many small children and babies. Since the primary land of a person comes from the mother, most women live with their parents and when they marry, the husband moves to his wife’s land. In this way the sons would move from the land and the daughters would stay, but there are numerous exceptions to this rule. Often the most preferred by the couple and most convenient situation for everyone is followed. Since all children have rights to several wātos, usually located on several different islands and atolls, there are numerous choices a person can make when deciding to live somewhere else. Life is very peaceful and extremely beautiful physically on the outer islands. Although it may be slow paced and calm, there is much work to be done and usually everyone is involved. The children have numerous jobs, often times trying to imitate their parents in different work that they are as yet too young to do, or merely helping with whatever they are told to do, either willingly or unwillingly. With such small islands, large households and everything needing to be done manually, it is imperative that all learn to work together and help each other. For this reason, usually there is a great deal of cooperation and responsibility taken by everyone except the youngest children. Although there is a definite division of labor with the men and women, there is much interchange in the work and most women and men know how to cook most types of food and do the other necessary daily tasks. The jobs that are almost exclusively women’s and girls’ work are scrubbing clothes (introduced by foreigners, since traditional clothing was made from mats), weaving mats, most of the cooking, and the major caring of the new born babies by their mothers. The men’s jobs are such things as fishing and gathering of the food such as breadfruit, pandanus, taro, iu (coconut embryo) for the women to cook. Also the men carve the outrigger canoes, and make the houses, although the women gather all the thatch and weave it for the houses. Since so much time today is spent in washing clothes for hours on end, this has resulted in less free time for the women, so usually to an outsider it appears as though the women do more work than the men. Depending on the season, and the availability of outside food, the amount of work a man does can vary greatly. If much rice and flour are available, the men do little gathering of food, but if there is none, then every day they must fish and gather iu (coconut embryo), or other foods, which can mean having to sail to other islands in the atoll. 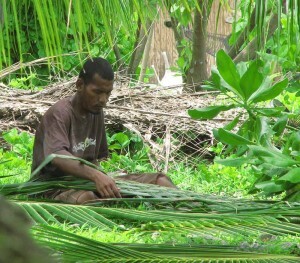 If the men are making copra, and the island has a lot of it, then this can consume a great deal of time and effort. 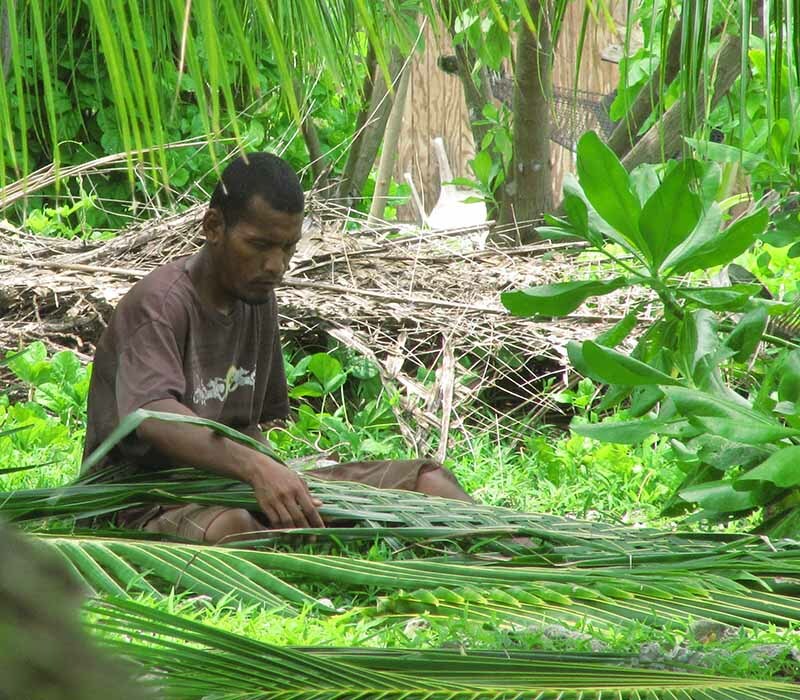 If the atoll is poor and has old and poor coconut trees, there may be little copra available and thus less work on the one hand, but more work in obtaining natural foods, since copra provides the main source of money to the people on the outer islands. Often times the men and women will kowainini (make copra) together, with the men cutting down the undergrowth; the women gathering the coconuts into large piles; the men husking the coconuts and bringing them to the house; the women breaking open the coconut shells; and everyone participating in smoking the copra or drying it in the sun. The last step of cutting the copra out of the shells is almost always done by the men with everyone helping to fill the bags. Some of the atolls today have co-op stores that buy the waini (copra) from the people, and with this money they in turn can buy from the store. The co-ops are resupplied by orders sent into Majuro on the short wave radios (which very often break down), and then the supplies are sent out to the islands on the field trip boats. Today some of the villages have a telephone and internet connection that can be used to communicate with Majuro or other atolls. It is provided for the entire population so one person oversees the use of the telephone and internet, and it is used only for emergencies, various types of networks such as the Education net, or Health net and for basic communication needs. There is a satellite dish on the islands/atolls where there is internet and phone connections. A few people in any given village may have their own short wave radio which means they can connect directly to someone else who has a short wave radio on another island or in Majuro or Ebeye. The short wave radios are run by solar power and each household has usually one electric light also run my solar power. If no co-op exists, or if the co-op order is not resupplied when a boat comes, a person’s waini is sold to the store company represented on the boat, and with this money the individual buys his goods directly from the boat. Since logistics are such a vast problem with such large ocean areas and only two or three government boats that can provide services, it is no wonder that communications and resupplying or supplying directly from a boat, can result in numerous problems, delays, and frustrations. Some islands have private stores where individuals buy large amounts from the boats directly. Often times this can result in a monopoly since the individual has money available and sometimes buys out almost all available supplies from the boat, which forces the people to buy from him, rather than the boat. Such people as the teachers, and health aides on each island where schools and dispensaries exist, receive government salaries. Their salaries supplement the available money on the outer islands since most people will help their relatives and friends obtaining food and other necessary items. These outside pay checks have also resulted in a less equal distribution of goods for some people, whereas with the extended family and the relationships of people, everyone has numerous mothers, fathers, sisters, brothers, cousins, and grandparents. The relationship of a person to his/her extended family is quite complex. The following is a simple explanation of the basic relationships that exist for everyone. All parallel cousins (children of mother’s sisters or father’s brothers) are considered sisters and brothers; cross cousins (children of mother’s brothers and father’s sisters) are considered as available spouses. Genealogies are usually fairly well known because of the lineage systems and as a result the relationships of people are carried down for many generations. All brothers and sisters (either direct or indirect) of the real grandparents of a grandchild are also grandparents to that child. Also, all the real mother’s sisters (direct and indirect) and father’s sisters are mothers to the real mother’s child. All brothers (direct and indirect) of the real father, are also fathers to his child. The mother’s brothers (direct or indirect) are rūkoream (Rālik) or wūllepam (Ratak), something like uncle, but in a possibly more respected position, for he may become the alap (head) of his mother’s lineage and thus her land, which is also the child’s lineage and land. As is evident in this brief explanation, it is almost impossible for a Marshallese to be alone, and through his or her extended family and land rights, he or she has much security and love. Although to outsiders it may seem as though babies and small children are smothered in affection and love, they are also disciplined, if loosely, and as soon as a younger child is born or adopted, which usually is within one and one half to three years, the older child is no longer favored and must learn to give and share in all aspects with the new child. Each child learns to give to the youngest not only food and articles but also love and affection. It is not unusual to see small children fondling and playing with and being very absorbed in the life of a new born baby. Almost all boys, as well as girls learn to care for babies, and when playing, the older children, even if very young themselves, automatically watch after the younger children or babies. Three types of people have rights on a particular plot of land. These are the irooj or lerooj (chief or chieftess), alap (lineage head), and ri jerbal (worker). The irooj is considered the owner of the land with permission from him either granted for use of a particular wāto (land plot) or understood from one’s family’s traditional use of a particular wāto. He or she is the only person of royal blood. The alap is the head of a particular lineage and often is the highest person in control of a particular wāto, who may be available to make decisions regarding his land when there are problems, for on many atolls no irooj is present. The alap makes decisions, often delegates who can work the land, especially in regards to making copra, and is the go-between for the ri jerbal and the irooj. The alaps usually make up the Councils found on the outer islands who meet to make local decisions in one particular village. Also the alaps decide how to divide the food at parties and keemems (first birthdays of babies), and how much food should be prepared when an irooj visits. Anyone may become an alap depending on his or her lineage. Both with iroojs and alaps, if a person is considered to be incapable mentally of carrying out his responsibilities then the position is delegated to the next person in line. Alaps are kajoors or commoners. The ri jerbals are the people who are designated as the workers on a particular wāto. A person may be an alap on one wāto, and only a ri jerbal on another, depending on inheritance and family land rights. From the ri jerbal is determined who has land rights and where, for usually if the woman or man is the ri jerbal on a particular wāto, his or her family can also use and work the same plot of land. In this way land distribution is very diverse and leaves several possibilities as to how and when it may be used as a place to live, a place to gather food, or to make copra. All land in the Marshall Islands is owned and basically controlled by the iroojs and leroojs (chiefs and chieftesses). Traditionally there were great warring parties which included the iroojs and his subjects of a certain area or atoll who would sail to other atolls in an effort to conquer and control new land and people. These war parties were common and resulted in frequent changes of power and land by different iroojs. The interchanging of the land and some of the power and influence through the wars of the iroojs was halted during the late 1800s by the various missionaries and other foreigners. As a result, the distribution of the land and power to the various iroojs and leroojs of today is based on the irooj families who were in power at the time the warring ended. Some iroojs and leroojs control areas in the Marshall Islands which may include several atolls, while others may control only parts of an island or atoll such as on Milli Atoll where there are numerous iroojs. Today, although the iroojs still exercise extensive control and influence over the people, the traditional power structure has changed greatly, since the National Government is run by the Nitijela or the national legislative body of elected officials from throughout the country. The irooj system is hereditary and passed through the mother (although today it is often passed through the father). Traditionally there were several divisions of iroojs. The highest division was and is an irooj or lerooj born of parents who were or are both iroojs. The other divisions ranged below this to the lowest division of iroojs being a person who has some irooj blood from one parent with the other parent being a commoner. This has also been modified somewhat because of a larger population, more marriages of iroojs and leroojs with commoners, and because of lineages dying out with uncertainty as to the next lineage in line. One of the main changes that has occurred because of the introduction of foreign cultures is the introduction of money into the irooj system. Traditionally the best foods and goods were given to the irooj and his family, and although this is still practiced on the outer islands, in Majuro and Ebeye money also plays a part in showing one’s respect to his or her irooj. Also a certain percentage of the money from copra goes to the irooj and alap (lineage head) for use of the land. As mentioned before in another context, this has created a much less equal distribution between the irooj class and the commoners. The Marshallese people have lived closely together physically, socially, and mentally for a very long time and they have learned to overcome disputes, differences, and foreign influence, and have always lived with a fair amount of harmony and cooperation on very small pieces of land surrounded by great expanses of ocean. Today it seems as though some of this is eroding due to the competition introduced by different religions, the desire for money by many people today, vast cultural upheaval, and the increase in foreign contact and influence. Nevertheless, the Marshall Islander moves through all these changes and upheavals with a great sense of calm and mutual concern and support for each other.